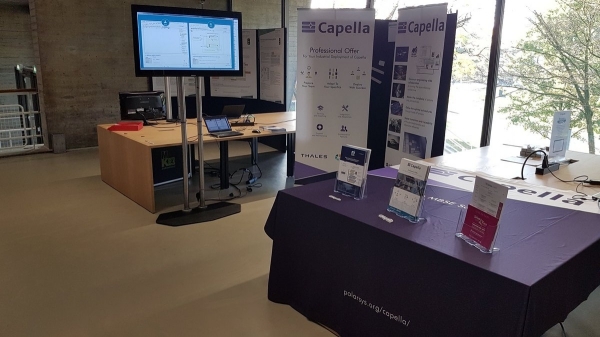 Nice experience for Capella in Eindhoven at the TNO-ESI Symposium! On October 3rd, Thales and Obeo were gathered in a shared booth at the TNO-ESI Symposium 2017 in Eindhoven. The TNO-ESI Symposium is a one day free event, dedicated to the managing complexity in embedded systems engineering. More than 500 attendees were gathered in this successful 2017 edition. At the innovation market, Thales and Obeo presented their collaboration that connect them since 10 years, particularly via the Open Source solution Capella. This solution is a comprehensive tool of Model-Based Systems Engineering integrating a tool-based methodology, Arcadia. Developed by Thales with the support of Obeo, Capella combines the opening and the simpleness of a ready to use solution. This significant event was a chance for us to show several Capella demos, some of which you can find out on Youtube. We were deligthed to talk and share with attendees about systems engineering. Our great thanks go to the TNO team for this great organization!